Permit to work procedure has been developed and refined by the chemical industry, however the principles and procedures also apply to the management of complex risks in other industries, the principle is that certain defined operations cannot be carried out without the specific permission of a responsible manager after thorough checks have taken place to make sure that all of the necessary precautions have been taken and that the work can go ahead safely. Where proposed work is identified as having a high risk, strict controls are required and those doing the work are responsible for following and ensuring that the safeguards set out in the permit are met and that no other work that is not authorised in the permit is undertaken. To be an effective training of those involved and monitoring procedures must be undertaken to ensure that the system is operating correctly, the site manager remains responsible for the operation of the permit system even where they have delegated the operation of the permit to another. 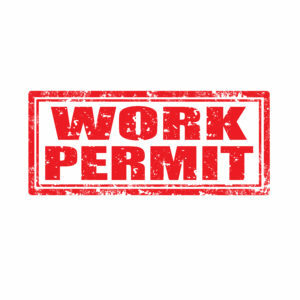 A permit to work document will normally specify, what work is to be carried out, who is authorised to do the work, the location of the work, the risks identified and the steps that have already been taken to make the plant safe, potential hazards that may remain, or may arise as the work is carried out and the precautions to be taken against these hazards and for how long the permit is valid. Some examples of where a permit to work may be required include working in confined spaces, work on railway tracks, working with asbestos based materials, roof work, repair work carried out near dangerous machinery or any work which involves the application of a naked flame such as welding, brazing or soldering. The person in charge of doing the authorised work would normally sign to certify that the work has been completed and to confirm the re-acceptance of the plant or machinery. During recent filming at a Petrol Plant, we needed a permit to work before we could enter the site as it was a high-risk site where we would be using cameras and sound equipment. Detailed information was recorded and documented and this was carried with us as we went around the site. On completion of filming within the allocated time, the permit was signed to certify that the work was complete and we were allowed to leave. Where ever possible all jobs especially those carried out routinely, hazards should be eliminated so that the work can be carried out safely without the need for a permit to work.